[ARCHIVED THREAD] - Rock island 2011 tactical upgrade project worth it? Hi all I have a few 1911's a couple of Springfields, a STI, and have a Colt Rail gun on layaway the one 1911 I keep going back to though is my Rock Island 2011 Tactical, I love shooting this gun and I am not sure what it is but I just really enjoy it, I was looking at Nighthawk's page and was wondering if I upgraded to a match threaded barrel/barrel bushing/barrel link, 1-piece Mainspring Housing / Magwell, Nighthawk/ Marvel Everlast Recoil System, beavertail grip safety, suppressor sights, and put a new Nighthawk trigger in there if it would be worth it? I am not the type to sell anything and I know would never get out what I put in (like my cars ) but would the Rock make a great platform to build up into something to rival my other 1911's or is it like putting lipstick on a pig? Thanks for any ideas or thoughts anyone here upgrade their Rocks to a higher level, pics? As a Rock Tac owner, I'd say "Lipstick on a pig." Springfield occasionally sells a full rail 1911 that would be better suited as a base gun. In fact, SACS (their in house shop) will be happy to do the upgrades you mentioned for a good price. I love my Rock, but you will never recoup any of your investments in the upgrades. I know its not your plan now, but there might come a time you would want to. Good luck, and if you decide to do it, post pics. Love my RIA as well. So I am getting the impression leave the Rock as is what about just getting a threaded barrel fitted for it and better trigger? I felt the same way, I ended up putting a Storm Lake Threaded barrel, into mine and then sending the Slide into Dawson Precision to have a set of custom Suppressor sights made and installed. I also went with a Swenson Drop-In National Match Barrel Bushing, and replaced the grips with a set of Hogue Wrap around. It was worth the effort, I run a AAC TI-ant45 on the front and it shoots great. You won't recoup the cost of the mods on any brand. 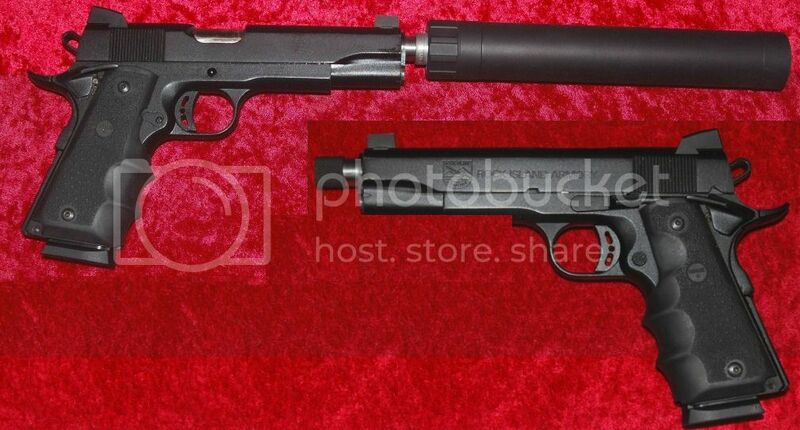 I hear you on that not something i would sell anyways so taking the money aspect off the table would the Rock with those mods I mentioned surpass my Springfield Operators and the Colt Rail Gun I have coming or at least give them a heck of a run for their money.... I got the Rock at such a low price several years ago if I put some money into it stills feels like a deal to me, I guess really what i am looking at is the Rock something that can be turned into a high level performer without the 3 grand price tag for a full on custom gun, or is the patform bad to start with? Thanks again guys.. If you already own the RRA, and the slide to frame fit is tight, I say go for it. Every Springfield that I have handled, or shot, needed work to be "nice". People brag about their customer service. How would they know that?